Jeanne Louise (Bouteiller) Wilkins, 85 of Havertown, PA, beloved wife of Robert W. Wilkins (deceased), passed away peacefully on December 28th, 2018 after a long illness at Bryn Mawr Terrace. Born June 22, 1933 in Danbury, CT, daughter of the late Eugene and Louise Bouteiller. Jeanne resided in Havertown for 65 years. 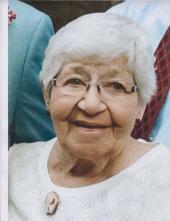 She was a devoted member of the Llanerch Presbyterian Church. Mrs. Wilkins was the loving mother of three surviving sons - Stephen, Douglas, and Timothy Wilkins, eight grandchildren, (Stephen) Emily; (Douglas) Kelley (deceased) and Meghan; (Timothy) Robert, Joshua, Michael, Andrew, and Jonathan and two great-grandchildren (Robert) Lydia and (Emily) Nora. She is preceded in death by her older brother John Bouteiller. She is also survived by her younger brother Roger Bouteiller of Newtown, CT and several nieces and nephews. followed by her Memorial Services at 10:00 AM. Please share your memories of Jeanne.